West Bay is Snooty-on-sea (apparently)! Well I never. Yesterday West Bay was included in a Daily Mail article about how the rich and famous are colonising Britain’s seaside hotspots. Read below what the Mail has to say about West Bay, one of the “poshest seaside towns in Britain”. Celeb spotting: Pauline Quirke , Billy Bragg, Fiona Phillips. Where to hang out: Riverside, the fish restaurant near the harbour. Best for: Fans of TV crime dramas. West Bay, just outside Bridport, is where TV series Broadchurch and Harbour Lights were filmed – and where Leonard Rossiter walked into the sea in The Rise And Fall Of Reggie Perrin, making the cliffs there Britain’s most famous after Dover’s white ones. 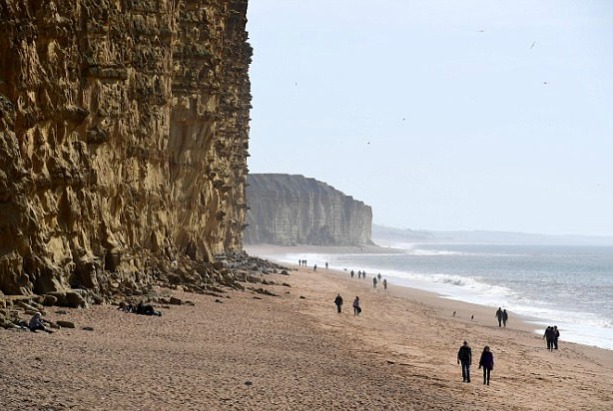 It’s on the fossil-laden Jurassic Coast, which used to attract natural history enthusiasts. Now, the crowd is more likely to be wearing Manolo Blahniks than sandals and socks, and be celeb rather than fossil hunting. West Bay is getting steadily more upmarket, thanks to hipsterfication of Bridport, a mile away, with its Arts Festival, and Saturday flea market, selling outrageously priced junk that Londoners insist will look fabulous in their Shoreditch flats. In case you want to read about the other posh seaside spots too, as judged by the Mail, here’s the whole article. Does it sound like West Bay to you? I am a little baffled by the West Bay snooty label, the idea that the place is teeming with the rich and famous. Have you ever spotted a celebrity there? I’m not sure Pauline Quirke fits the bill of snooty celeb anyway! Surely everyone is not swanning around the local caravan holiday park wearing their Manolos? I don’t think the comment that “hipster” Bridport’s eclectic street market sells “outrageously priced junk” is true either. I love the jumble of old and new, craft and bric-a-brac. Did the reporter who wrote the article ever actually visit West Bay and Bridport? Poshest seaside town? Snooty-on-sea? No fear. I like West Bay just the way it is. A mix of places to eat, a choice of activities. Something to suit every pocket and every taste, whether snooty or not!